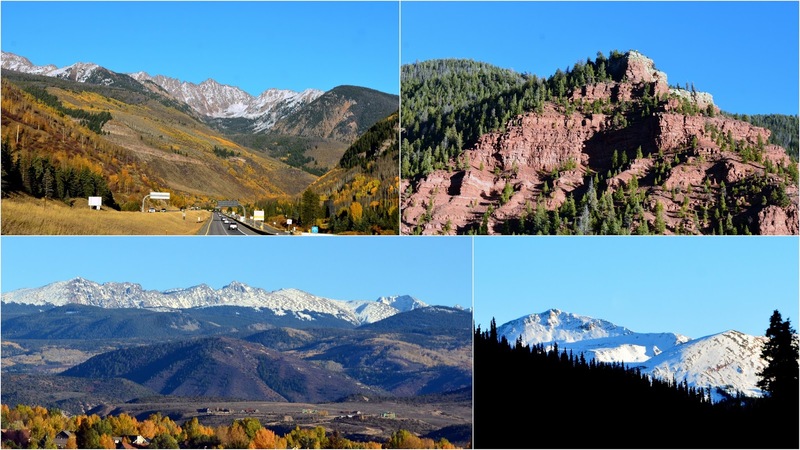 Colorado has spectacular scenic byways, and my husband and I have been fortunate to have been able to drive quite a few of them in the nearly five years we've lived here. 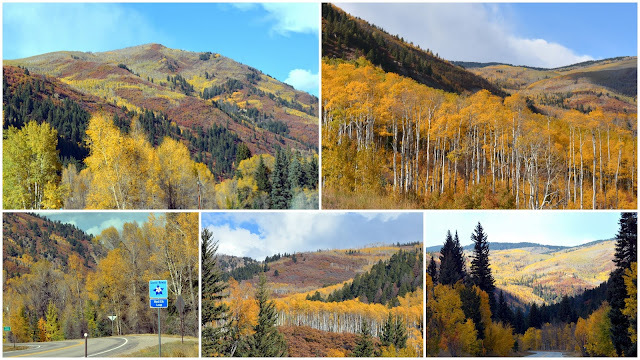 When we were in the western part of the state, spending time away for our anniversary, we decided to take an autumn drive on CO highway 133, part of the West Elk Loop Scenic Byway, to see the historic towns of Marble and Redstone and to drive partially over McClure Pass. If we wanted to drive the entire 204 miles of this scenic byway loop we would have continued on through different numbered roads all the way to Crested Butte, a total trip that would have taken an estimated six to eight hours of driving. We entered CO 133 at Carbondale, Colorado, with the magnificent view of Mount Sopris in the photo above. Although Sopris' peak, at 12,965 feet (3,952 m) was already snow capped in early October, the foliage at its base was still changing into autumn color, so we were hopeful to see beautiful fall foliage along our drive. We were not disappointed! The aspens and cottonwoods were changing into glorious shades of gold and orange, accented by red rock hills and green verdant forests. 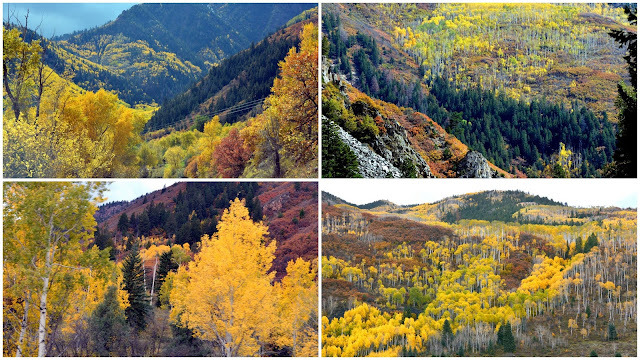 ...and patchwork quilts of colorful trees sprinkled all over the high surrounding Elk Mountains. The vistas were full of autumn color and we gasped and "oohed and ahhed" in awe as we drove along! The entire West Elk Loop Scenic Byway is a two lane highway that passes through three designated wilderness areas and through thousands of acres of National Forests in a rural part of western Colorado. It had been home to countless generations of Ute Native Americans. White settlers came to this area first in search of animal pelts and then in search of gold and minerals. Many stayed to farm and ranch. 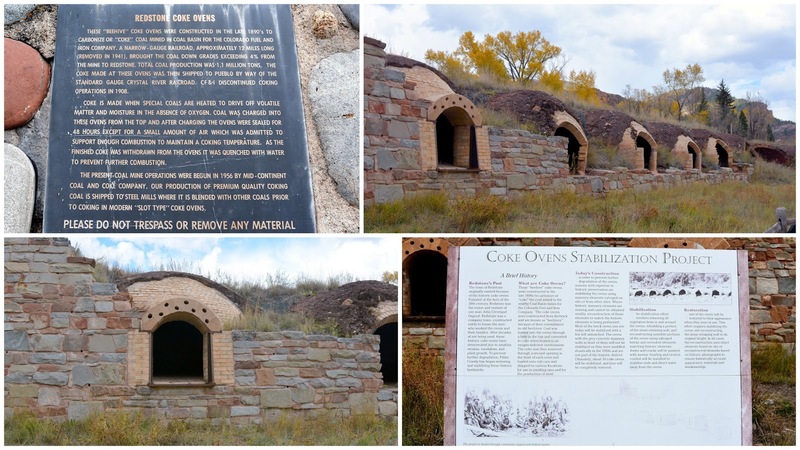 We stopped to see the restored coke ovens in the town of Redstone. Redstone was established by John Cleveland Osgood, a self made man who came west and founded the Colorado Fuel and Iron Company in 1887. He built 249 coke ovens to turn coal into coke. The Crystal River railroad (now defunct) was constructed to facilitate coal for mines four miles away and to the coke foundries in Pueblo. They functioned for only about ten years when technology changed. Now on the National Historic Register of Historic Places, you can read more about the coke ovens and their restoration on this link. 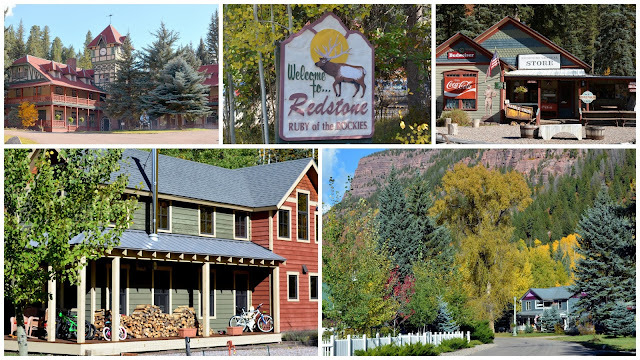 The charming little town of Redstone is called the "Ruby of the Rockies," not only for its red rock canyon location, but because most of the town's original structures, built by Mr. Osgood to house the coal miners and coke workers, had indoor plumbing and electricity, which were luxuries at the time for mining camps, and lead to the nickname. The large Redstone Inn, seen in the upper left corner of the photo above, was originally a dormitory for unmarried male miners. We continued on our way, driving along valleys of vast aspen forests and towering Elk Mountains. We soon saw the sign for the turnoff to go towards the town of Marble. The tiny town of Marble is the home of Yule Marble quarry, first discovered in 1873, a pure white marble obtained from a mountain that is 9,300 feet high (2,800m). The marble is so pure and luminous that it was used in the construction of the Lincoln Memorial and the Tomb of the Unknowns in Washington, DC, and the Equitable skyscraper in New York City, and the Colorado State Capital and City and County Building, as well as buildings in other states. The quarry has gone through many "boom and bust" periods over the decades, due to the high price of the required high altitude mining process. It has been owned since 2010 by an Italian company based in Carrara, Italy. As we drove close to the town the scenery was amazing! 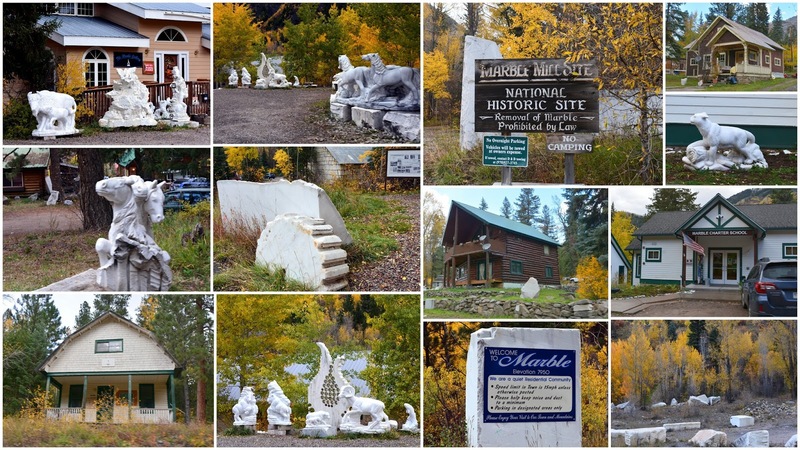 In the small town of Marble we saw many art studios with marble sculptures outside, as well as the site where the old quarry factory once stood. There were many pieces of marble lying along the road, but it is illegal to remove any marble from the area. After leaving Marble we drove back to the West Elk Loop Scenic Byway where we climbed a portion of McClure Pass towards the summit. The pass is usually open year round, except when there is a heavy snowstorm. At a summit elevation of 8,755 feet (2,671 m) it is not especially high, but it is very steep, with 8% and 9% grades. 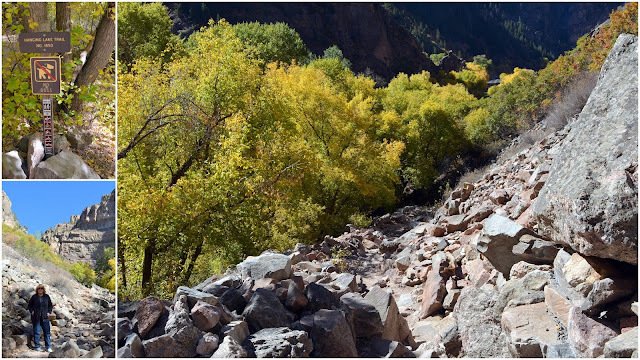 Before it was improved in 1947, McClure pass was a rough cattle road and before that a path the Ute Native Americans used to transverse the valleys. We stopped at the summit at a roadside pull out to take photos of the Elk Mountains in the distance. The autumn foliage and play of light from the sun behind the clouds made the mountains change colors in a beautiful show. I took many, many photos, and could have stayed there all day just to soak in all the beauty! If we continued on over McClure Pass we would have entered the town of Paonia, Colorado. Instead, we turned around and went back to the Redstone area, and then back to Glenwood Springs, as we had dinner reservations that evening. 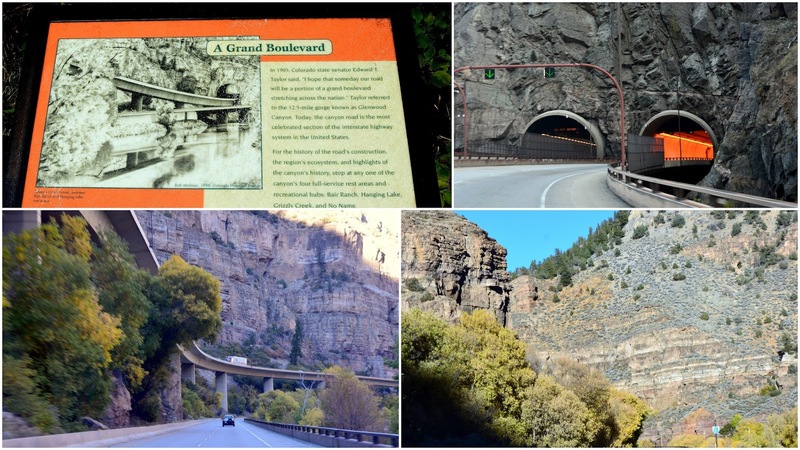 We thoroughly enjoyed the section of the Elk Loop Scenic Byway that we traveled, and the historic towns we saw, and the spectacular views from McClure Pass. 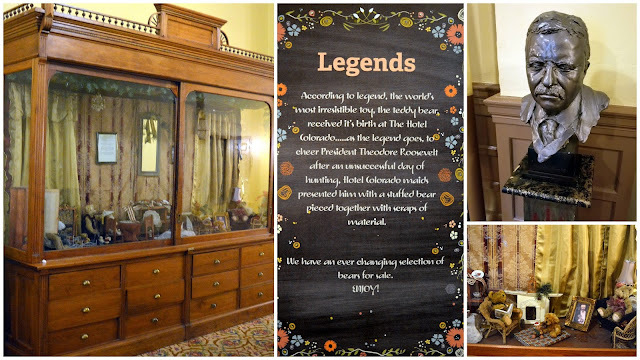 I know this post is already long, but I wanted to show a little of Hotel Colorado where we stayed in Glenwood Springs. It was opened in 1893 and retains much of its old time charm. 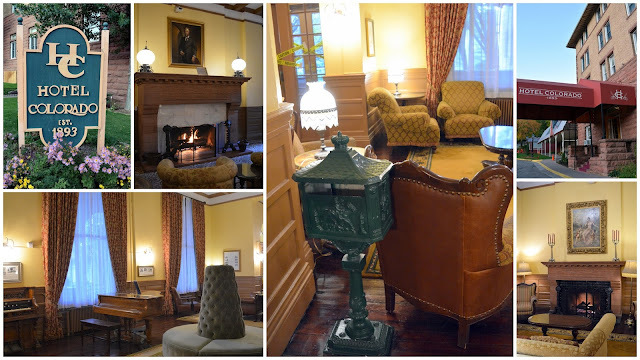 One interesting legend of the hotel is that President Theodore Roosevelt stayed in the hotel during a hunting expedition in the area. He was unsuccessful and the hotel maids made a stuffed bear for him as a consolation gift--the first 'Teddy Bear"! There was a display case near the hotel coffee and gift shop filled with teddy bear memorabilia. 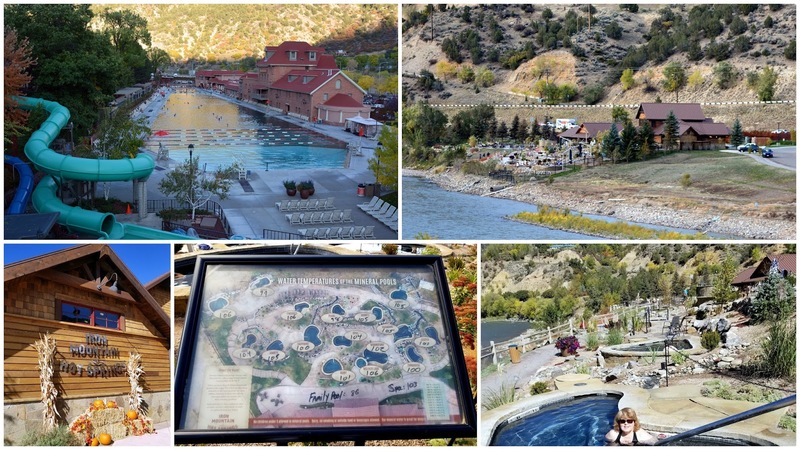 Glenwood Springs is famous for its giant hot springs pool, as seen in the upper left of the photo collage above. We went to the relatively new Iron Mountain Hot Springs, which consists of 16 mineral hot springs pools and a freshwater family pool with a jetted spa located next to the Colorado river. You can see a diagram of the pools in the collage. The temperature of the water ranged from 98 degree Fahrenheit to 107 degree Fahrenheit. It was the perfect way to relax for a day! I hope you enjoyed seeing our 43rd anniversary trip that we made this year to Glenwood Springs, and our visits that I blogged about this month to the very scenic Maroon Bells and the Aspen Snowmass Wilderness, Rifle Falls State Park, Hanging Lake and Spouting Rock, and now the Elk Scenic Byway. We feel blessed to live in this beautiful state and be able to enjoy all it has to offer! Before my husband and I drove home from Glenwood Springs, Colorado, in early October, where we celebrated our anniversary, we had one more sight we wanted to visit. 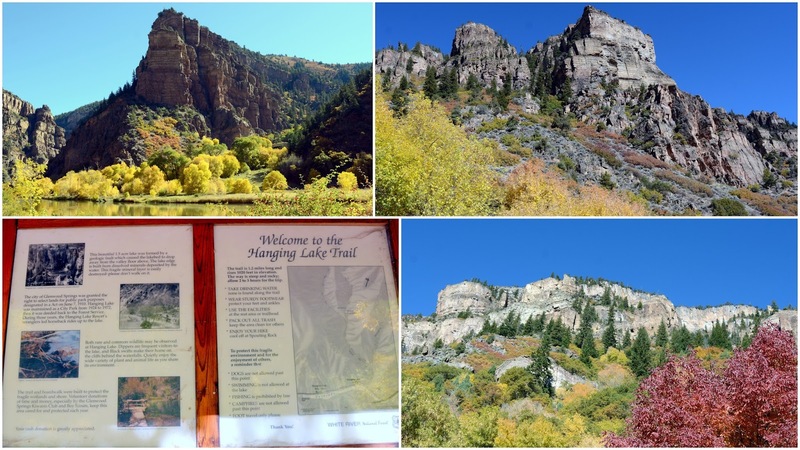 As we drove early in the morning alongside the Colorado River, within the steep fall foliage lined Glenwood Canyon walls, we headed towards the most popular hike in Colorado, and one of the most unique and beautiful sights in the state--Hanging Lake. Since moving to Colorado, I had seen many photos of Hanging Lake, which is located high up in a canyon that branches off Interstate 70, about seven miles east of Glenwood Springs. Along with the Maroon Bells Mountains, which we also saw on this trip--click here to read that post--it is one of the most photographed places in Colorado. I was filled with trepidation, however, as although the hike is short one, at 1.2 mile, it is also very steep, a thousand feet elevation gain to an elevation of 7,200 feet (2194.5 m), and the trail is full of rocks and boulders to climb over, giving it a "difficult" rating. Hanging Lake is part of the White River National Forest, and attracts 1,100 visitors on an average day in summer! 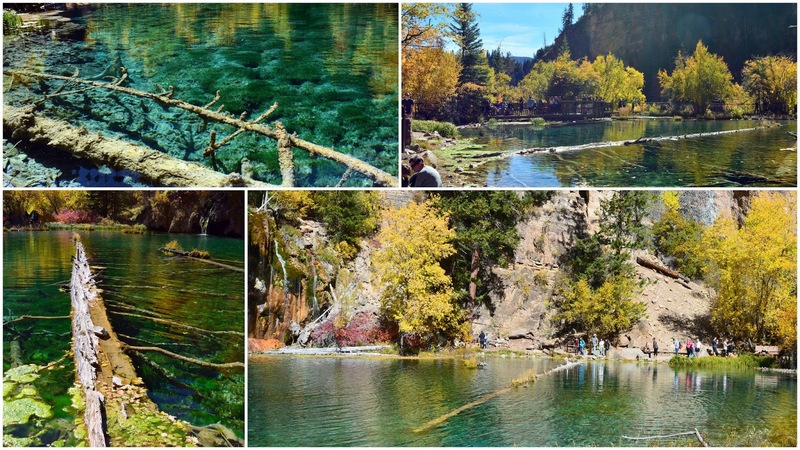 As Colorado's population grows, and the state becomes more popular with visitors, many new regulations will soon go into effect limiting visitation to protect the fragile natural beauty of sites such as Hanging Lake. More about that later in this post. We hoped that since we were visiting mid week, and after peak season, there would not be many people on the trail, but when we pulled into the parking lot a Ranger told us we would have to wait on a line of cars for a parking spot for an estimated 45 minutes! Happily, our wait was less than thirty minutes, and we parked and began walking towards the trail head. The views along this flat section of the long walkway are beautiful. There was a sign explaining how the 1.5 acre lake was formed by a geologic fault that caused the lake bed to drop away from the valley floor above. Dogs, fishing, swimming, and camping are not allowed in the area to protect the fragile environment. When we reached the trail head we soon found out that the description that there were many rocks to climb over was not an exaggeration! Up, up, up, my husband and I climbed. Sometimes the rocks were arranged as steps, and sometimes there were brief sections of rocky soil. All the while as we climbed Dead Horse Creek flowed down, at times in small waterfalls. The moist canyon air allowed ferns to grow, an unusual sight to see in high altitude and usually low humidity Colorado environment. The trail switch backed over the creek, with around seven wooden footbridges. There were a few benches along the way, near some of the footbridges, to allow for rest. The trail is narrow, so slower hikers (us) yielded to faster hikers, both going up and down. Everyone we met on the trail was very encouraging. Most of the hikers were in their 20's to 40's and there were many families. The hikers that were descending kept telling us to keep going, that the sight was worth it! One lady told me to be sure to continue up to see Spouting Rock after seeing the lake, which I'm glad she did! At one point I turned around to see how high we had traveled up the canyon and saw this beautiful sight! What a beautiful and breathtaking place it is! We admit that tears of joy came to our eyes when we first saw it, The tears were a combination of realizing we actually accomplished a very strenuous hike for two retirees, and tears because it was even more beautiful than we hoped! Photos just don't do the whole scene justice. ..crystal clear aquamarine colored water. The color is formed by carbonate minerals in the water. Above is a video I took of Hanging Lake that is on my blog's facebook site at this link. (You may have to turn the sound on by touching the "x" next to the microphone on the lower right corner) As you can see, and hear, the water flows quickly, and the pretty foliage around the lake bed is lush and gives an exotic garden appearance to the lake. There is a nice boardwalk with benches that surrounds most of the lake that we walked around to take photos. We walked around to the far shore where the iconic tree log lies in the water. There is a sign that says "please stay off the log" but sadly there have been instances of people not doing so. Happily, all the visitors behaved themselves during our visit. Any contact with the water has an effect of its ecological balance, so visitors are asked to have no contact with it. 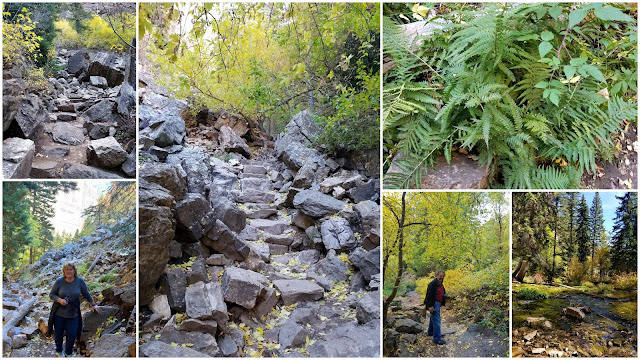 This website has good FAQ's regarding visiting Hanging Lake. The autumn foliage surrounding the lake really enhanced its beauty. After spending time at Hanging Lake we felt rested enough to climb even higher on the trail to Spouting Rock. As you can see by the notice added to the sign, changes are coming to how many people can visit Hanging Lake and Spouting Rock. Over 150,000 people visited the area in 2016, and the US Forest Service has realized that measures need to be taken to ensure safety and to preserve the natural beauty of the area, especially because, sadly, in the past few years there have been incidents of vandalism in the area and people not obeying rules. There are PDF files on this US Forest Service website that explain the reasons behind the change and the proposals being considered. Most likely visitors will be required to have a permit (free), and will be limited in number, and will be required to use a shuttle bus service to and from the parking area during peak season, most likely May to October. We climbed higher and were amazed to see Spouting Rock! For centuries water has eroded a passage through the limestone to exit out a sheer cliff wall as a spectacular waterfall. This is a video of me standing near the falls on my Mille Fiori Facebook facebook page at this link. (Again, you may have to turn on the sound) As you can see and hear, they are pretty powerful! To see what the falls look and sound like from behind it, go to my MilleFioriFavoriti Instagram at this link. Place your cursor over the photo to see the video play arrow on the Instagram page. You can also follow my entire Instagram feed on this link to see more photos from my travels and my everyday life. Hiking back down the 1.2 mile trail to the parking lot took us almost as long as hiking up the trail. We regretted that we did not have our hiking poles to help us with stability. 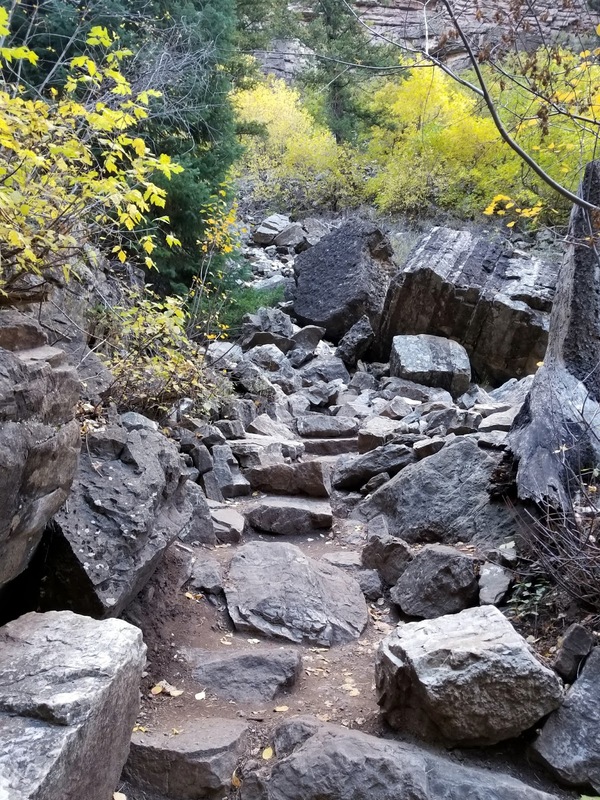 The 1,000 foot steep trail down was hard on my knees and feet as momentum and gravity was carrying me forward and I had to be careful not to fall. We were tired, but we were also a little giddy and exhilarated! The hike is expected to take 2 to four hours to accomplish round trip, and we were in the 4 hour range because we also stopped for water breaks and to allow faster hikers to pass us. We were back on the "grand boulevard" of Interstate highway 70, that runs through the 12.5 mile Glenwood Canyon. The canyon section of the interstate is called the most celebrated part of interstate highway system in the United States. We passed magnificent Colorado scenery on our drive. All the way home we kept talking about how happy we were that we did the Hanging Lake hike, and how proud we were that we were even able to accomplish it! It was truly an achievement for us and a memory we will always cherish.